RealClear Politics posted an article on April 16 about Nathan Sibley, York County, Pa., who entered the court reporting program at his local community college. Since graduation, he has earned the job of JumboTron captioner for the Pittsburgh Pirates major league baseball club after interning with the organization. Twin Cities.com reported on Feb. 24 that Benchmark Reporting Agency, based in Minneapolis, Minn., has partnered with Anoka Technical College on an annual $1,000 scholarship. Congratulations to the Arizona Court Reporters Association (ACRA) on winning the NCRA 2019 Court Reporting & Captioning Week proclamation drawing. 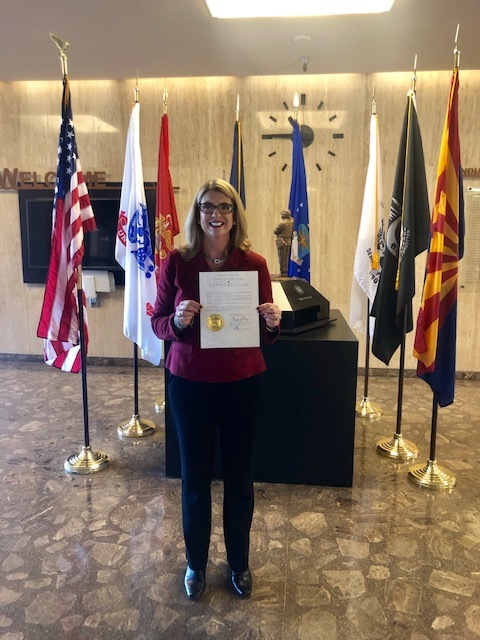 ACRA President Kate Roundy, RPR, a freelance court reporter from Phoenix, Ariz., submitted the proclamation signed by Gov. Douglas A. Ducey. This was the first year NCRA has offered the chance for state associations to enter a drawing for a free national Convention & Expo registration. A total of 16 states submitted proclamations. 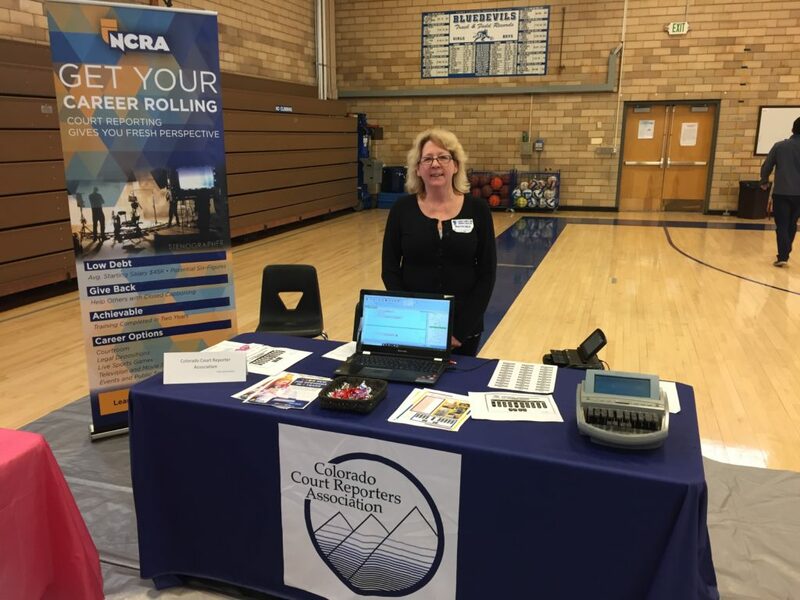 NCRA member Lisa Wagner, RPR, an official court reporter from Highlands Ranch, Colo., won the grand prize of a free NCRA Convention & Expo registration sponsored by the National Committee of State Associations (NCSA). Wagner delivered 11 presentations promoting the profession during the NCSA Challenge that kicked off at the 2018 NCRA Convention & Expo in New Orleans, La., and ended with the last day of 2019 Court Reporting & Captioning Week held Feb. 9-16. “I think it’s so important to participate in not only Court Reporting & Captioning Week but also other events such as career fairs and presentations to help promote the court reporting and captioning profession,” said Wagner. “We really have a unique skill, and students are truly amazed and excited to see realtime or to touch and write on a steno machine. I asked a group of eighth grade girls what they thought a court reporter did. One girl answered hesitantly wasn’t it some kind of code. When I told her that she was exactly right, that it is a code or shorthand, she had a wonderful look on her face and said, ‘I never get anything right!’ That young lady will remember court reporting. That’s why I do this, to see the looks on their faces,” she added. First prize in the NCSA Challenge went to Kristen Wurgler, RPR, a CART captioner from Cottage Grove, Wis., who participated in six events promoting the profession including educating co-workers about the benefits of CART captioning. “Honestly, National Court Reporting & Captioning Week is one of my favorite celebrations of the year. It’s my privilege to work as a CART provider at the University of Wisconsin-Madison,” Wurgler said. “My colleagues at the McBurney Disability Resource Center are disability accommodation specialists who potentially will be recommending a CART accommodation for deaf and hard-of-hearing students. They need to be familiar with how CART works, the challenges of it, and the environments in which CART can be beneficial (remote or in the classroom). 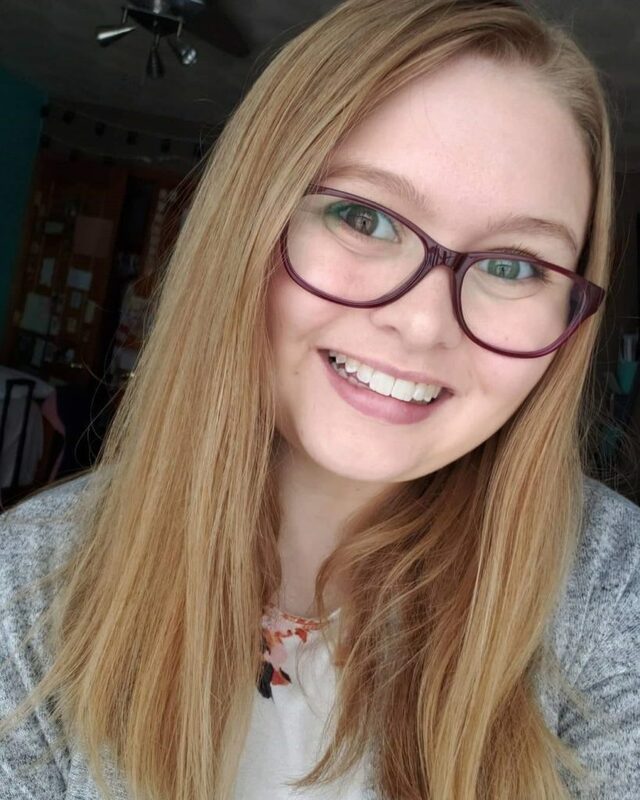 I believe every member in a team needs to be celebrated so that we can encourage and support not only each other but, as a CART provider, the students we serve as well,” she added. 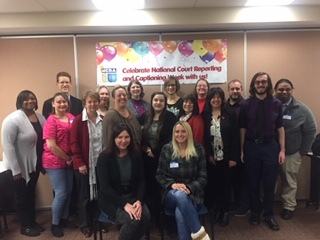 NCRA’s 2019 Court Reporting & Captioning Week was celebrated by state associations, members, students, schools, and vendors in a variety of ways that showcased the profession and the skills needed to learn and write on a steno machine. Several-last minute activities adding to the long list of how people celebrated the week are listed below. NCRA member Patti Ziegler, CRI, CPE, court reporting program chair at the Des Moines Area Community College was featured in a segment about court reporting that aired on WeareIOWA.com about the court reporting and captioning professions. The Madison College in Madison, Wis., court reporting program produced a video for YouTube about court reporting and captioning careers that features Jane Kohlwey, a current student and attorney. The school also hosted an information table on campus to showcase the professions. Plaza College in Queens, N.Y., produced a radio announcement to celebrate Court Reporting & Captioning Week that was aired on AM970 during the Joe Piscopo show. The school also hosted reporters from local newspapers and participated in the NCRA Student Speed Contest. 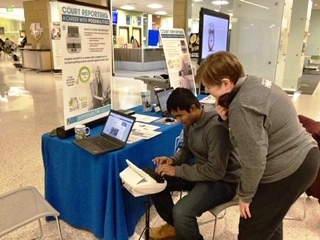 Students at Ohio’s Cuyahoga Community College’s (Tri-C) court reporting and captioning program also held a number of events in honor of Court Reporting & Captioning Week. In addition to an annual write-a-thon and bake sale in the school’s Galleria, the students obtained sponsor funds from professionals, friends, and family to write on their steno machines for four hours. While writing, they mirrored the Birdbox Challenge, by putting a blindfold on to prevent them from watching their screen. 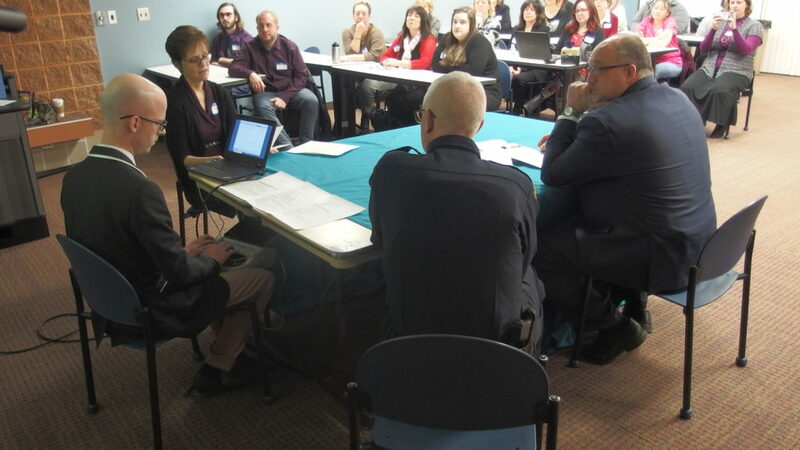 Other activities included a professional pop-up sponsored by the Court Reporting and Captioning Club that afforded students the opportunity to see live demonstrations and chat with professionals, and a mock deposition was held that featured Timothy Peters, a Tri-C graduate and official court reporter in the role of the court reporter. In addition, Tri-C’s associate dean, Dr. James Ploskonka, acted as one of the attorneys, while full-time faculty member Dr. Jen Krueger served as the opposing counsel. Finally, a real detective from the city of Cleveland’s police department served as the witness. Students were also treated to a remote demonstration of CART and caption by Tri-C graduate Deana Kohn via WebEx, during which she captioned a wide variety of events from game shows to live news broadcasts. Read more about NCRA’s 2019 Court Reporting & Captioning Week. 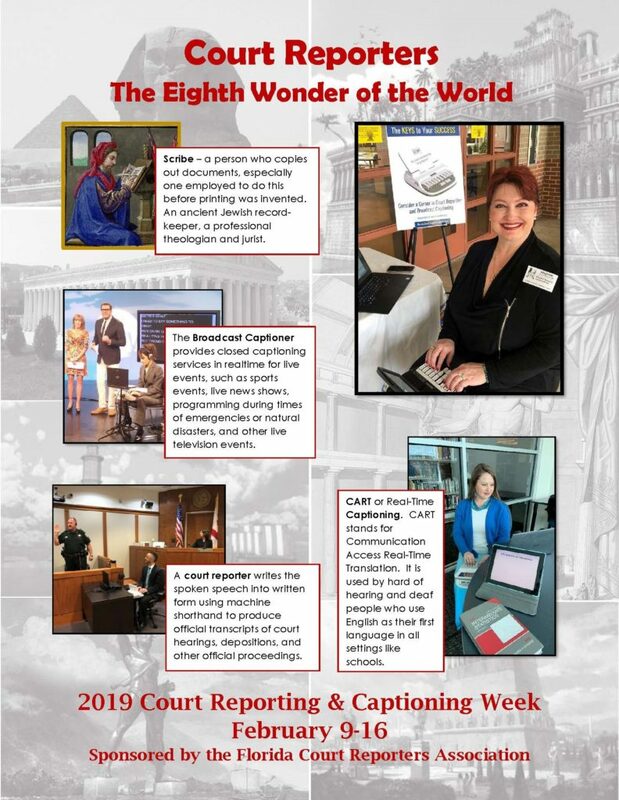 Thanks again to everyone who participated in 2019 Court Reporting & Captioning Week and who made this seventh year of celebration a great success! Mark your calendars now for 2020 Court Reporting & Captioning Week happening Feb. 8-15. 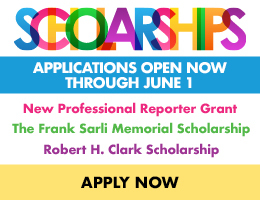 Contact pr@ncra.org for more information about what’s available. Jane Kohlwey helps spread the word at Madison College during Court Reporting & Captioning Week. 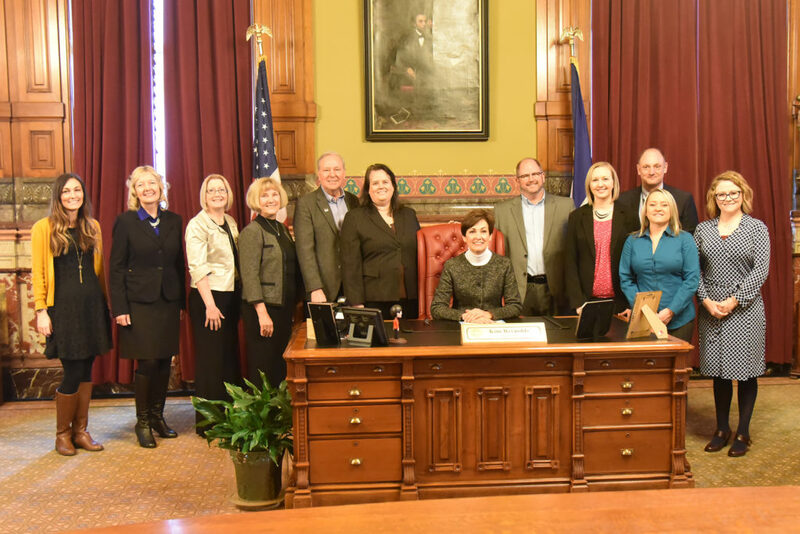 NCRA’s seventh consecutive Court Reporting & Captioning Week event was celebrated across the nation by state associations, individual members, students, and firms, via an array of events ranging from open houses to contests to time spent with lawmakers. At the national level, U.S. Rep. John Shimkus from Illinois recognized the week in a written speech submitted for the official record of the U.S. House of Representatives. In addition, U.S. Rep. Rodney Davis from Illinois delivered a similar speech from the House floor on Feb. 14, recognizing the event. 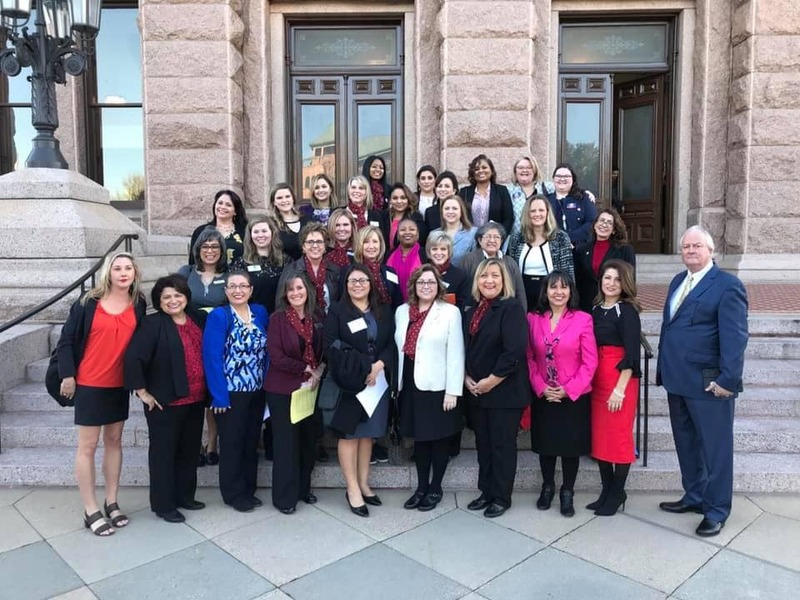 Members of the Texas Court Reporters Association were at the Capitol on Tuesday, Feb. 12. Official proclamations for the week were also issued in 16 states including: Arizona, California, Idaho, Illinois, Iowa, Kansas, Kentucky, Mississippi, North Carolina, Ohio, Oklahoma, South Carolina, South Dakota, Tennessee, Texas, and Wisconsin. Official proclamations were also issued in Eugene, Ore., and Bexar County, Texas. All states that submitted an official proclamation will be entered into a drawing by NCRA to win one free 2019 Convention & Expo registration. In addition, states that entered the annual NCSA State Challenge, a friendly contest among state associations and individual NCRA members to spread the word about the benefits of a career in court reporting or captioning, will be entered into a drawing for a variety of prizes ranging from complimentary NCRA event registrations to vouchers for continuing education. The winners of both contests will be announced in the Feb. 26 issue of the JCR Weekly. NCRA President Sue A. Terry, FAPR, RPR, CRR, CRC, a freelance court reporter from Springfield, Ohio, celebrated the event by participating in “Spread the Word,” an online event hosted by the College of Court Reporting in Valparaiso, Ind. Terry joined other representatives from the court reporting and captioning professions to talk to students firsthand about the benefits of a career in court reporting or captioning and to provide motivation and inspiration to those who attended. Other schools that marked the event with special activities included Anoka Technical College in Anoka, Minn.; Green River College in Auburn, Wash.; the Captioning and Court Reporting program at Cuyahoga Community College (Tri-C), Cuyahoga, Ohio; Madison College, Madison, Wis.; and Plaza College, Queens, N.Y.
A number of state court reporter associations reported activities such as get-togethers for members, attorneys, and judges, as well as courthouse displays, contests, social media campaigns, and more. In honor of the week, NCRA also released several videos of members promoting the court reporting and captioning professions by sharing what they love about their careers. The first five of the series are available at NCRA’s YouTube Channel. Members and state associations are encouraged to share the videos on social media sites as well as use them to promote the profession at career days and other events where the skills of court reporters and captioners are showcased. 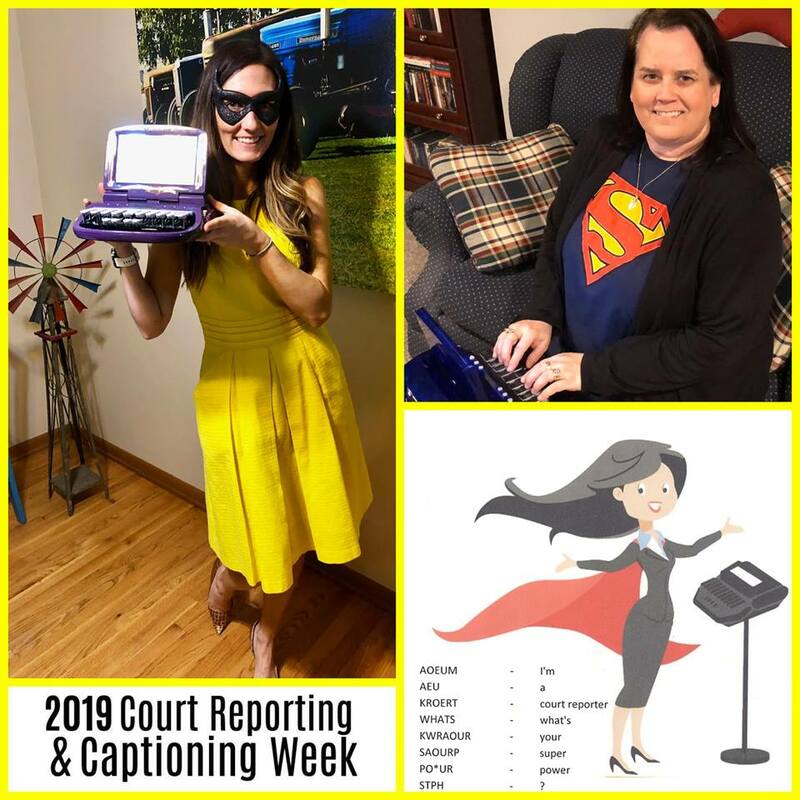 See how others celebrated NCRA’s 2019 Court Reporting & Captioning Week. 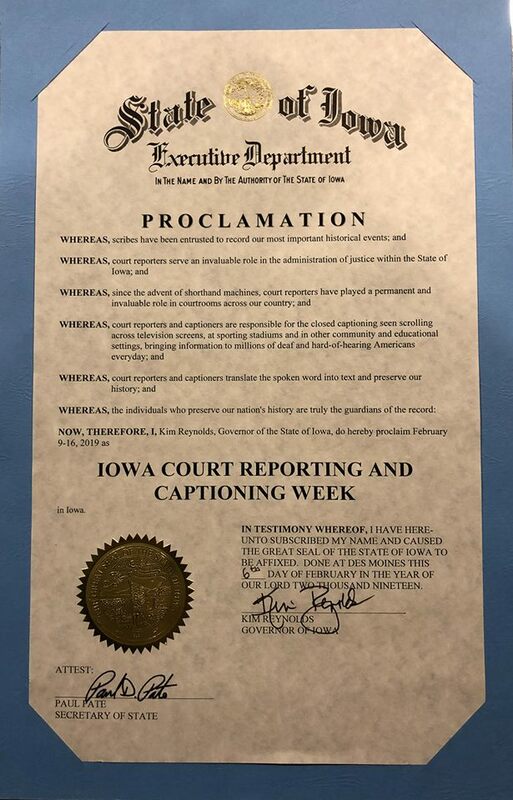 Thanks to everyone who participated in 2019 Court Reporting & Captioning Week and making this seventh year of celebration a great success! Mark your calendars now for 2020 Court Reporting & Captioning Week happening Feb. 8-15. NCRA’s 2019 Court Reporting & Captioning Week is a great impetus for veteran reporters to head into reporting schools and give both students and newbies a taste of what successful and amazing careers lie ahead of them. As experienced professionals, we have the privilege and advantage (and obligation, I would offer) of being able not only to show them a living, breathing sample of what’s possible, but also to give them a leg up on the mistakes, errors, or omissions (yes, omissions) we have made and bring this whole industry into perspective for a new generation of verbatim reporters. We are the face of the past and present, and they are our future. On Feb. 9, I, along with my husband, Richard, a reporter of nearly 45 years, was honored to present a film I wrote and produced called “Evil Zombie Vampire Court Reporter from Hell” to students at Brown College of Court Reporting in Atlanta, Ga. 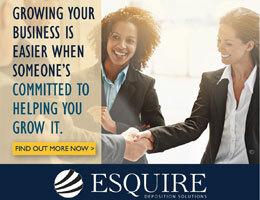 The film is a 43-minute spoof of a deposition in which the star commits 47 professional infractions, any one of which could have gotten her dismissed from her job and many of which could have potentially ended her career. Just to give you a little taste, the court reporter is 15 minutes late to the deposition, and she offers no apology or excuse. In fact, within the first five minutes, her actions clearly point to the fact that the attorneys in the film are in for a very, very long day. Every time over the past five years that I have presented this film — as well as its sequel, “Evil Zombie Vampire Lawyer from Hell” — I watch it from beginning to end along with the attendees. I never tire of hearing students and veteran reporters alike gasp and giggle at the evil reporter’s bad behavior. It heartens me to know that the principles of preparedness, professionalism, and propriety, not to mention common sense, are ingrained in the majority of court reporters. Each person who watches the film receives a list of those 47 sins that evil reporter has committed, and I encourage everyone to hold off looking at the list and write on a separate piece of paper the number of bad behaviors they observed and then compare that list to the distributed material. I am so pleased to say, when we got to the lecture portion of the session at Brown College, the students were able to volunteer more than half of the unprofessional antics demonstrated in the film. Brown College requires my book Talk to the Hands, a practical guide for the newbie, to be used by students in their career development class, which is one of the courses offered just prior to graduation. At each film presentation, I supply a workbook for that book, along with exemplars of cover, appearance, and certificate pages, among others, for students to use as a template when first entering into the court reporting workforce. As a proud participant in NCRA’s online mentoring program, before I get off the phone with a dedicated court reporting student who’s stuck at 150 wpm or who has just emerged from theory and is feeling overwhelmed, I make sure that they know I went through the same angst, managed to get through it, and love (nearly) every minute of my workday. And the paychecks aren’t bad either! Because our profession has expanded so rapidly through technology, one of my mantras at every “evil” film presentation, on every mentoring phone call, at every meet and greet for new students, is realtime, realtime, realtime. That skill is what separates the proverbial men from the boys and expands our opportunities for personal and professional growth. In fact, the “evil reporter” is vehement in refusing to provide realtime to the movie’s attorneys. In my early days of doing realtime, I felt as if I were sitting in the conference room in my dirty pajamas, and everyone present could plainly see how incompetent I was because of a misstroke here and there. I’m not afraid to share this and other similar observations with newbies, to let them know that with time and experience and a commitment to attaining higher speed through practice even after graduation, these insecurities will fade and be replaced with a satisfaction and acknowledgement of one’s own competence that will give rise to that new generation of professional court reporters. 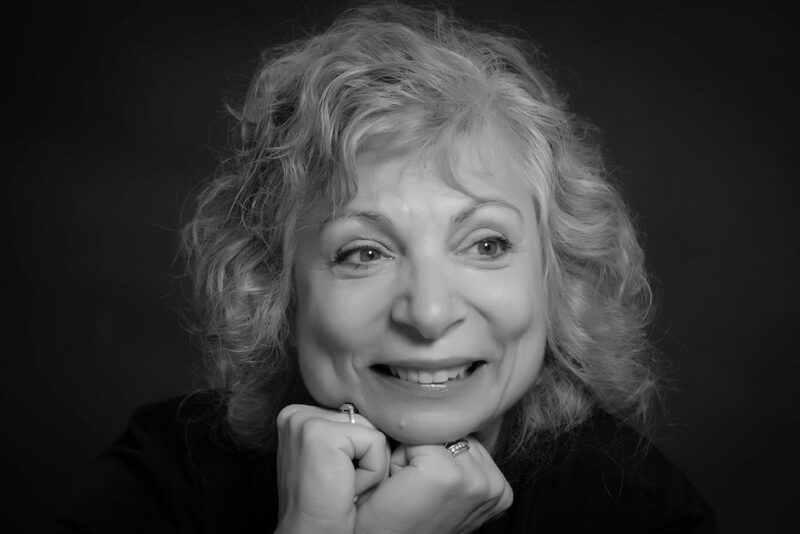 Maxyne Bursky, RPR, CRR, CRC, is a freelance court reporter from McDonough, Ga. She can be reached at bullymax1@aol.com.